Thank goodness today's topic is Christmas Movies. 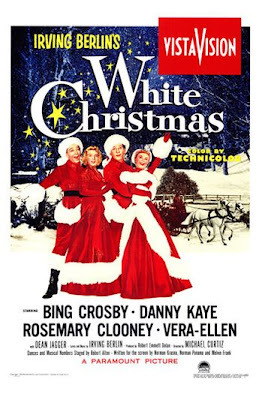 So keeping with my Christmas Edition of Theater Thursday, today's featured movie is my favorite Christmas movie by far, White Christmas! Since I can remember, we've had Bing Crosby's White Christmas playing as we decorate our Christmas Tree. I can remember ever line of this movie. I know every word to every song and I think I probably even know some of the dance steps. If you've never seen White Christmas. It's about 2 music and dance performers, Wallis and Davis, who met while in the Army and at war. Once out of the Army and the war over, they begin performing together and become a huge success. 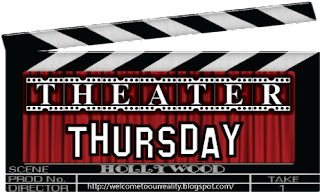 While out on the road performing and before their holiday break the guys decide to see an act of two sisters-The Hanne Sisters, performing as a favor to an old Army pal. Once Wallis and Davis see the Hanne sistes their lives are never the same. Following the girls to Vermont, they run into their old, retired General who's fallen on hard times as an inn keeper without snow. The guys take it upon themselves to bring their entire show to the inn and put on a show that will bring in the crowds. Along the way they find, love, happiness and a new kind of success. Now link up and play along!! I need to watch this movie! I hear how amazing it is all the time, and I've never watched it! Thanks for co hosting and have a fab day! Oh I love White Christmas! One of my favs around the holidays! Oddly enough I never saw this, I really need to though! Can you believe I have never seen this? It is on my list. Classic! Bing Crosby is perfect for this time of year. I've watched this a few Christmas's with family and enjoyed it. I love White Christmas, it's such a classic! 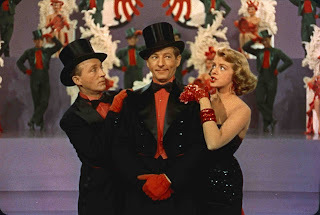 Okay so I am a horrible person and have never seen White Christmas. I am such a classic movie junkie. I mean I am obsessed with Doris Day... I am so going to have to watch it. You have inspired me. I remember this form last you also... a favorite of mine as well! One of my all time favorite movies. I watch it with my Mom and siser every year. Each time, it still amazes me that these people could actually sing, dance, AND act. True performers. Just last night I had my first holiday gathering with a few girls and we started talking about this movie and my friend that hosted happened to have it so we put it on in the background. I LOVE this movie! We're only 18 Days from Christmas!